The international terrorist and self-professed Marxist revolutionary known as Carlos the Jackal received a life sentence — his third — on Tuesday for a 1974 attack on a Paris drugstore that killed two people and wounded 34. PAHO: The total number of chikungunya cases in the Americas grew by 207 after leaping by more than 7,000 cases the week before. Over 500 measles cases were reported for January 2017 in the WHO European Region. Measles continues to spread within and among European countries, with the potential to cause large outbreaks wherever immunization coverage has dropped below the necessary threshold of 95%. 559 measles cases were reported in the Region for January 2017. Of these, 474 cases were reported in 7 of the 14 endemic countries (France, Germany, Italy, Poland, Romania, Switzerland and Ukraine). Preliminary information for February indicates that the number of new infections is sharply rising. In all of these countries, estimated national immunization coverage with the second dose of measles-containing vaccine is less than the 95% threshold. “I urge all endemic countries to take urgent measures to stop transmission of measles within their borders, and all countries that have already achieved this to keep up their guard and sustain high immunization coverage. Together we must make sure that the hard-earned progress made towards regional elimination is not lost,” continues Dr Jakab. According to reported data, the 3 measles genotypes circulating in Romania since January 2016 were not spreading in the country before, but were reported in several other European countries and elsewhere in 2015. Comprehensive laboratory and epidemiological data are needed before the origin of infection and routes of transmission can be concluded. Italy has seen a sharp rise in cases in the first weeks of 2017. With 238 cases reported so far for January 2017 and preliminary information indicating at least as many cases for February, the total number of cases reported for 2016 (approximately 850) may soon be surpassed. Measles is a highly contagious virus that can cause potentially serious illness. As measles remains endemic in most parts of the world, it can spread to any country, including those that have eliminated the disease. Every un- or under-immunized person regardless of age is therefore at risk of contracting the disease; this is especially true in those countries where persistently low immunization rates increase the risk of a large outbreak with possible tragic consequences. National authorities should maximize their efforts to achieve and/or sustain at least 95% coverage with 2 doses of measles-containing vaccine to prevent circulation in the event of an importation. The WHO Regional Office for Europe is working closely with the national health authorities of countries at risk and in the midst of large measles outbreaks to plan and implement appropriate response measures. These include enhancing surveillance and identifying and immunizing those at heightened risk of infection, especially susceptible persons who may be or come in contact with infected persons, as well as engaging communities to encourage vaccination for all those who need it. In adopting the European Vaccine Action Plan 2015–2020, all 53 Member States of the Region committed to eliminating measles and rubella as one of the Region’s priority immunization goals. 2 countries have not submitted annual status updates. WHO technical experts cooperate closely with European countries to achieve this goal, providing comprehensive support to strengthen immunization programmes, increase population immunity and confidence in vaccines, build disease surveillance capacities, and respond to outbreaks in line with countries’ commitment to elimination. On 9 March 2017, the National Institute for Public Health and the Environment (RIVM) in the Netherlands reported a case of yellow fever to WHO. The patient is a Dutch adult female traveller who visited Suriname from the middle of February until early March 2017. She was not vaccinated against yellow fever. The case was confirmed for yellow fever in the Netherlands by RT-PCR in two serum samples taken with an interval of three days at the Erasmus University Medical Center (Erasmus MC), Rotterdam. The presence of yellow fever virus was confirmed on 9 March 2017 by PCR and sequencing at Erasmus MC, and by PCR on a different target at the Bernhard Nocht Institute for Tropical Medicine, Hamburg, Germany. While in Suriname, the patient spent nights in Paramaribo and visited places around Paramaribo, including the districts of Commewijne (Frederiksdorp and Peperpot) and Brokopondo (Brownsberg), the latter is considered to be the most probable place of infection. She experienced onset of symptoms (headache and high fever) on 28 February 2017 and was admitted to an intensive care unit (University Medical Center) in the Netherlands on 3 March 2017 with liver failure. The patient is currently in critical condition. Suriname is considered an area at risk for yellow fever and requires a yellow fever vaccination certificate at entry for travellers over one year of age arriving from countries with risk of yellow fever, according to the WHO list of countries with risk of yellow fever transmission; WHO also recommends yellow fever vaccination to all travellers aged nine months and older. This is the first reported case of yellow fever in Suriname since 1972. Enhancing vaccination activity to increase vaccination coverage among residents. Suriname will continue with its national vaccination programme and will focus on the district of Brokopondo. A catch-up vaccination campaign is also being conducted to increase coverage in Brownsweg. Enhancing epidemiologic and entomologic surveillance including strengthening laboratory capacity. Implementing vector control activities in the district Brokopondo. Carrying out a survey of dead monkeys in the suspected areas. Conducting social mobilization to eliminate Aedes aegypti breeding sites (e.g. by covering water containers/ barrels). Issuing a press release to alert the public. Mapping of the suspect area of Brownsweg, as well as the Peperpot Resort. 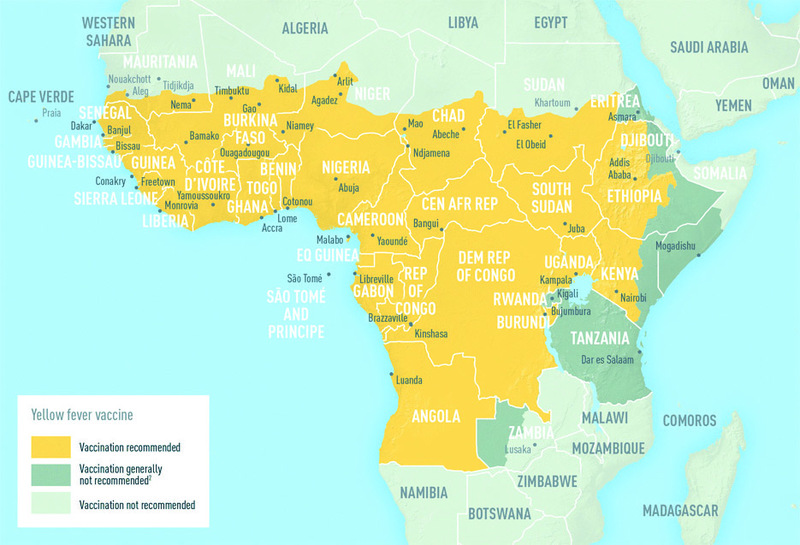 Yellow fever is an acute viral haemorrhagic disease that has the potential to spread rapidly and cause serious public health impact in unimmunized populations. Vaccination is the most important means of preventing the infection. Suriname is a country with a risk of yellow fever transmission in endemic areas. Vaccination is recommended before travelling to Suriname for all travellers aged nine months and older. Suriname requires proof of vaccination against yellow fever for all travellers over one year of age. Suriname introduced the yellow fever vaccination into the routine program for all children aged one years old in 2014.The estimate of national immunization coverage is 86% and only includes children aged one years old. The unvaccinated populations living in the endemic areas are at high risk of yellow fever infection. The current report of a travel-associated case provides evidence to consider local transmission of yellow fever in the country. More investigations are also needed for animal health sectors. In addition, Suriname shares borders with Brazil, which has been experiencing yellow fever outbreaks since January 2017 (the largest outbreak of yellow fever in the Americas in the past three decades). Sequencing and comparison to cases from various other countries is still ongoing, but it is likely that the case is not related to the yellow fever outbreak in Brazil. As South America is currently experiencing a cyclical increase in the number of cases in non-human primates and human cases, an increase in the number of cases in unvaccinated travellers returning from affected areas in South America is not unexpected. The risk of spread of the disease by non-immunized travellers from Suriname to the countries that have the vector for the transmission of the yellow fever virus is considered to be low but cannot be ruled out. 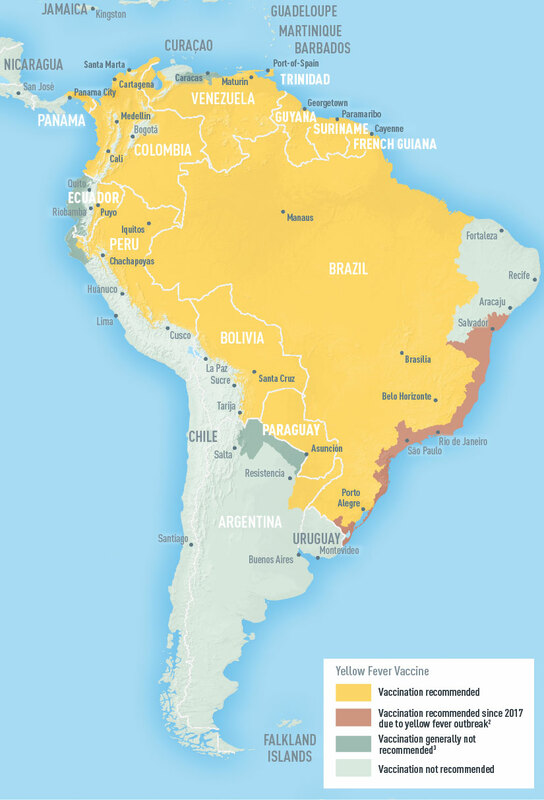 Currently, five countries in South America report yellow fever virus activity: Brazil, Bolivia, Peru, Colombia and Ecuador. This multi-country yellow fever virus activity might reflect current, wide-spread ecological conditions that favour elevated yellow fever virus transmissibility among wildlife and spill-over to humans. The sequencing analysis of currently circulating strains in Brazil, Bolivia, Colombia, Peru, Ecuador and Suriname should provide insight whether the human cases in these countries are epidemiologically linked or represent multiple, independent spill-over events without extensive ongoing community transmission. Promotion of health care seeking behaviour while travelling and upon return from an area at risk for yellow fever transmission, especially to a country where the establishment of a local cycle of transmission is possible (i.e. where the competent vector is present). Seeking care in case of symptoms and signs of yellow fever, while travelling and upon return from areas at risk for yellow fever transmission. This case report illustrates the importance of yellow fever vaccination for travellers to countries with risk of yellow fever virus transmission, even for countries that have not reported cases for decades. WHO, therefore, urges Members States to comply with the requirement for yellow fever vaccination for travellers to certain countries and the recommendation for all travellers to countries or areas with risk of yellow fever transmission (see ‘Yellow fever vaccination requirements and recommendations; malaria situation; and other vaccination requirements – List of countries, territories and areas’ in related links). Viraemic returning travellers may pose a risk for the establishment of local cycles of yellow fever transmission predominantly in areas where the competent vector is present. If there are medical grounds for not getting vaccinated, this must be certified by the appropriate authorities. WHO does not recommend that any general travel or trade restriction be applied on Suriname based on the information available for this event. Nigeria: As of 19 March 2017, a total of 1407 suspected cases of meningitis and 211 deaths (case fatality rate: 15%) have been reported from 40 local government areas (LGAs) in five states of Nigeria since December 2016. As of 19 March 2017 (epidemiological week 11), a total of 1407 suspected cases of meningitis and 211 deaths (case fatality rate: 15%) have been reported from 40 local government areas (LGAs) in five states of Nigeria since December 2016. Zamfara, Katsina and Sokoto account for 89% of these cases. Twenty-six LGAs from all five states reported 361 cases in epidemiological week 11 alone. Twenty-two wards in 15 LGAs have crossed the epidemic threshold. Three of these LGAs share borders with Niger. NmC is the predominant serotype in this outbreak. The most affected age group is 5 to 14 year olds and they are responsible for about half of reported cases. Both sexes are almost equally affected. WHO and partners including National Primary health Care Development Authority, UNICEF, Nigeria Field Epidemiology and Laboratory training Program, eHealth Africa, Médecins Sans Frontières, Rotary International, and Nigeria Centers for Disease Control and Prevention are providing support to this outbreak. Nigeria Centers for Disease Control and Prevention, with support from the WHO, is taking the overall lead in coordinating the response at the national level. Daily coordination meetings are being held at the state and LGA levels. The rapid response teams are conducting active case finding, performing lumbar puncture of suspect cases and training local staff on case management. Case management is being carried out at the public health centres at the LGA level. 19 600 persons were vaccinated with the meningococcal ACWY vaccine in Gora ward in Zamfara state. 500 000 doses of meningococcal AC PS vaccines and injection supplies was approved by the International Coordination Group (ICG) for utilization in Zamfara State which are planned to arrive on 27 March 2017. Katsina state is preparing an ICG request for submission. The successful roll-out of MenA conjugate vaccine has resulted to the decreasing trend of meningitis A, however, other meningococcal serogroups are still causing epidemics. The most recent outbreak that has been reported was in Togo due to Neisseria meningitidis serogroup W (see Disease Outbreak News as published by WHO on 23 February 2017). The outbreak response consists of appropriate case management with reactive mass vaccination of populations. 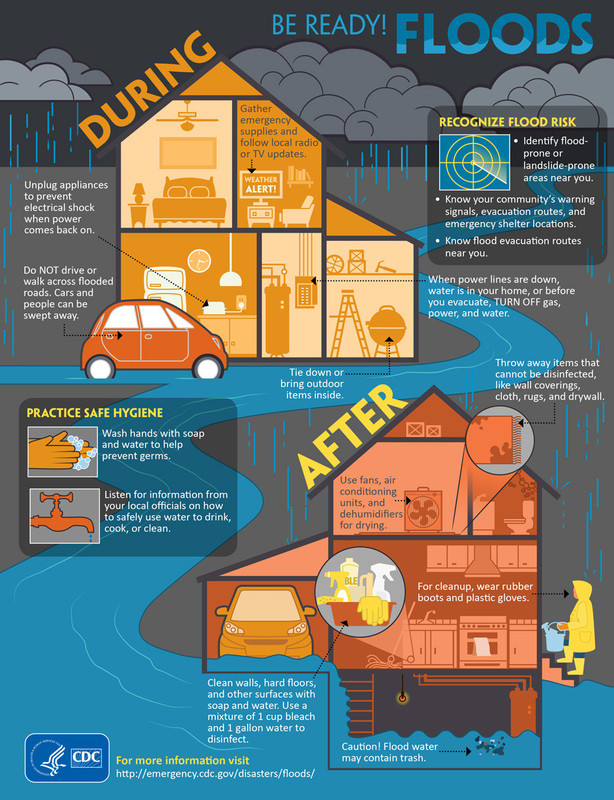 Promptness of the reactive campaign is essential, ideally within four weeks of crossing the epidemic threshold. WHO does not recommend any travel or trade restriction to Nigeria based on the current information available on this outbreak. Torrential rain and violent winds lashed residents along the coast of northeast Australia as Tropical Cyclone Debbie churned closer to shore Tuesday. NWS: Scattered to numerous severe thunderstorms are expected across the Lower Mississippi and Ohio Valleys into the Tennessee Valley this afternoon and evening. Very large hail, damaging winds, and a couple tornadoes will be possible. Tropical Cyclone 13P (Debbie): Thousands of Australians fled their homes on Monday as a powerful cyclone bore down on coastal towns in Queensland, where authorities urged 30,000 people to evacuate low lying areas most at risk from tidal surges and winds of up to 300 km per hour (185 mph).